It's hard to make a bigger impression than this! Oriental Lilies cover this large bouquet in fragrant white and pink blooms. They will be taken aback by the stunning size of this bouquet with 1 - 2 large blooming heads on each stem. 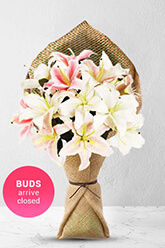 To ensure long life, the flowers may arrive with some closed buds which will soon open as fresh blooms and create a lasting impression.Lilies may be sent closed/partially closed in order to prevent damage and to last longer.The featured vase is not included however; for a lasting impression we recommend a Superior Vase which is the ideal selection for this gift. Ontime delivery and good service. Flower is great too! Always prompt and beautiful flowers! Thank you for delivery of beautiful flowers. Delivered flowers to Japan...ordered from the US. Delivered closed and will look great for a long time! Flowers were delivered promptly as usual and we're just what I ordered. As a country based customer you always deliver!!! Simply perfect!! I will definitely use you again in the future. If you don't already have an app..you need one!